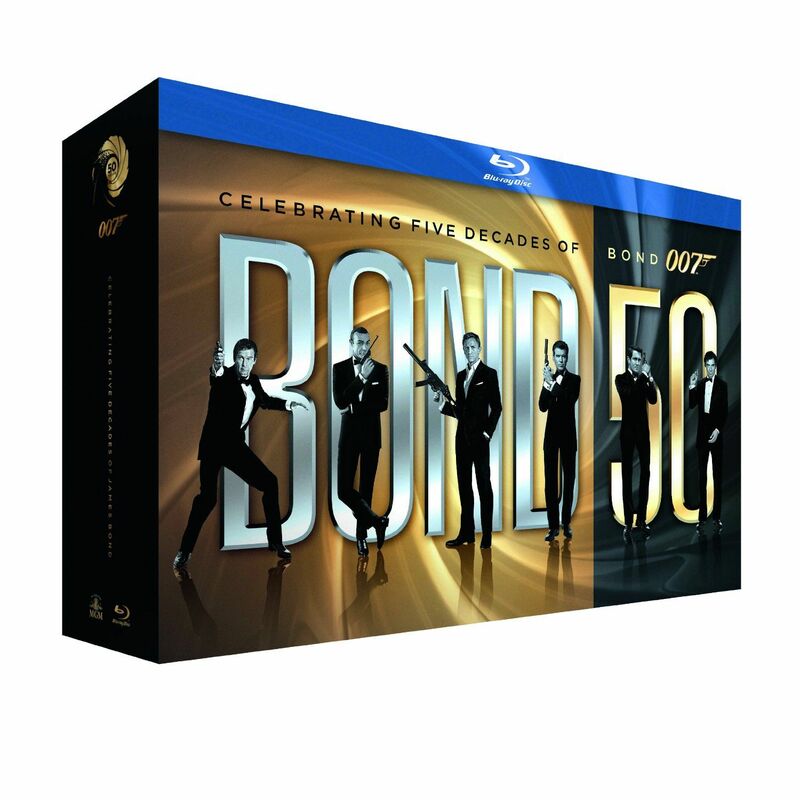 The specs for the complete James Bond Collection have been released and are up on Blu-ray.com . Although it certainly looks like an impressive set at first glance, there’s a couple of glaring niggles – there are no exclusive new features on the film-specific discs (although there is a 23rd disc with a couple of new documentaries and the SKYFALL videoblogs) and Casino Royale is the standard single disc release from 2007 rather than the deluxe 2-disc set from 2008. I’d also hoped that the rather lacklustre selection of QUANTUM OF SOLACE extras was due for beefing up too but alas, that was not to be either. Gripes aside, the set is on sale for around £90 on Amazon and HMV, so it’s a very reasonable way to give 22 films an HD upgrade. UK release date is set for 24th September. NEW – The World of Bond – the 007 films have a look, style and attitude that is signature Bond. From the cars, to the women, to the villains and even the music, Bond films stand apart. The World of Bond takes the viewer through the best of five decades worth of classic James Bond in one thrilling montage. The World of Bond showcases the fascinating and entertaining interplay among unforgettable moments of danger, seduction, adventure and a dash of that distinguished humor that fans have cherished from the beginning up until now. To add to the experience, The World of Bond featurette will also offer a Pop-Up Trivia option to challenge even the sharpest of fans with little known facts and interesting trivia from the Bond Universe. NEW – Being Bond – there’s only one James Bond – but he’s proven too much for only one actor to play the role. In the franchise’s 50-year run, six distinguished actors have taken on the part and secured a spot in cinematic history. Sean Connery, George Lazenby, Roger Moore, Timothy Dalton, Pierce Brosnan, and Daniel Craig each reflect on the impact and importance of taking on such a famous role. With this piece, gain insight into what each actor brought to the character and discover how they shaped the world’s most timeless secret agent. Commentary with Director Roger Spottiswoode and Dan Petrie, Jr.
Based on the novel by Daphne Du Maurier, Nicolas Roeg’s DON’T LOOK NOW is rightly considered to be a classic of the horror genre and regarded as a landmark of British cinema. Roeg’s film manages to present the picturesque city of Venice as a nightmarish landscape; one draped in a constant blanket of fog and where danger can lurk anywhere in the city’s labyrinth of alleyways and bridges. But director Aldo Lado (THE NIGHT TRAIN MURDERS) had himself done a great job of depicting an edgier side of the city of canals a year earlier with WHO SAW HER DIE?, a fantastic giallo that has been criminally overlooked by the critical cognoscenti. Not only does Lado’s film share the same setting as Roeg’s but DON’T LOOK NOW also touches on many of WHO SAW HER DIE’s themes too. Anyone familiar with DON’T LOOK NOW will recognise other similarities between the two films, particularly that of the grieving parents whose loveless marriage becomes rekindled after the death of a precious daughter. One can only hazard a guess that the writers of WHO SAW HER DIE – Francesco Barilli, Massimo D’Avak and Ruediger von Spiess must have been familiar with Du Maurier’s original text, as elements of Lado’s film border on plagiarism. That said, the editing of the film also echoes that of Roeg’s, with Lado and his editor, Angelo Curi, utilising flash cuts—something that is atypical of the giallo but used to great effect in DON’T LOOK NOW—which would indicate that the British director must have been aware of WHO SAW HER DIE? too. WHO SAW HER DIE? marked Lado’s second foray into the realms of the giallo after his excellent debut, SHORT NIGHT OF GLASS DOLLS the year previously; although if fate hadn’t intervened, Lado would not have directed the film. Although an established director by 1972, Lado had worked his way up from assistant director, most notably on Bernardo Bertolucci’s THE CONFORMIST. Having made SHORT NIGHT OF THE GLASS DOLLS as director, Lado was preparing to work as an assistant director on Bertolucci’s LAST TANGO IN PARIS before filming was postponed to allow Marlon Brando to return to the US and film THE GODFATHER. Without a project in the pipeline, Lado was delighted to accept directorial duties on WHO SAW HER DIE? when his SHORT NIGHT OF GLASS DOLLS producer, Enzo Doria came calling, and the rest is history. Given that Lado is a native of Venice, it would be hard to imagine any other director making WHO SAW HER DIE? now, as he managed to resist the temptation to make the film look like a travelogue. With the exception of a smattering of shots of the Rialto Bridge and St Mark’s Square, the director is content to show a side of the city that had rarely been captured before, and in doing so, orchestrates some truly beautiful compositions with his cinematographer, Franco Di Giacomo. The film has a very distinctive iconography and its black lace-clad killer is an unforgettable image and a real genre standout. Ennio Morricone’s score is also terrific and again truly memorable; it’s haunting use of child vocals will stay with you for days after. WHO SAW HER DIE? was previously released on DVD in the US by Anchor Bay Entertainment as part of their Giallo Collection, on what is regarded to be a great disc. This same transfer was utilised by Blue Underground for their recent re-release. However, Shameless’ disc now stands as the definitive article, though it does not include the brief interview with Lado that adorns the American discs. What makes the Shameless release essential is that it features footage not included on either of the US discs. Said footage consists of an extension to the scene in which a murder takes place in the room with the birdcage. In the US versions, we see the assailant stab the victim five times, whereas the victim is knifed seven times in the Shameless version. Though this additional material amounts to mere seconds, it manages to prolong the viciousness of the attack. The Shameless disc presents WHO SAW HER DIE? In its original 2.35:1 ratio and is enhanced for widescreen televisions. The print itself compares favourably to the American releases, as it is somewhat brighter overall. That said, the level of detail is slightly better on the Anchor Bay disc, with the Shameless release looking a little soft by comparison. This is however a very minor issue. The sound is presented in English mono and is strong and consistent throughout. Rounding out the package is the film’s trailer and a collection of previews for other Shameless releases. WHO SAW HER DIE? is an excellent and very stylish giallo. Shameless’ release of the film is an essential purchase for giallo completists and with the inclusion of footage not seen in any other version, makes it a worthwhile double-dip for those that already own one of the US releases.